How do you follow up one of the most successful and acclaimed debuts of recent memory? 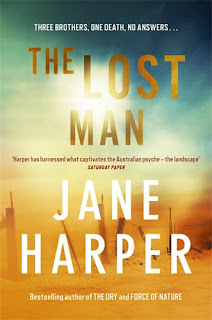 A tricky challenge that's seen several authors stumble, but Melbourne author Jane Harper showed she was no one-hit wonder when she switched from drought-stricken farmland in the CWA Gold Dagger-winning THE DRY to rain-swept, wintry bushland in FORCE OF NATURE, her second Aaron Falk thriller. Third time round, Harper lures readers back to the arid landscapes of the Outback, but federal cop Falk is absent. 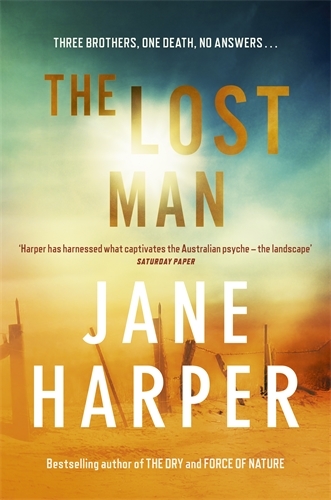 THE LOST MAN begins at a remote and barren border of massive cattle ranches that sprawl over heat-struck landscapes of western Queensland. This isn't the touristy meccas of the Gold Coast or Cairns, instead a parched climate that everyone who lives there knows can quickly kill. So why would Cam Bright, the golden middle child of the Bright farming family, leave the safety of his truck to wander to his death at an old stockman's grave? The marks in the dusty earth tell the story: he was scrambling for shade in the hours before he succumbed. An isolated death that didn't come easy. As older brother Nathan and little bro Bub meet at the stockman's grave, the questions swirl: why would Cam, the brother who seemed to have it all, take such a final walk? Had financial pressures shoved him over the edge? What about the woman from his past who recently tried to get in touch? Or is something even more sinister behind it all? Nathan, whose own prior actions have seen him largely living in exile in recent years, is pulled into a family situation packed with grief and secrets. As events unfold, relationships fray and long-hidden truths come to light. Nathan is forced to confront several incidents from his own past, missteps and misperceptions, and the different ways various people view the same events, forming their own 'reality' that endures. Until it's shaken. THE LOST MAN is a stunning standalone. A taut and elegant rural mystery centred on family drama more than a police investigation, it's a page-turner with real substance. There's a taut elegance and quiet intensity to Harper's prose as she surveys the pressures of Outback farming and examines the darkness that can fester within families and isolated communities. A superb tale that shimmers with subtext and subtlety. For a couple of years now we've talked about Harper's special debut; it's time we just talked about her as a special author.